Not sure my brand new tow vehicle can tow the 400!?!? OMG! I just bought a new bigger and stronger tow vehicle so I could buy a [email protected] 400. I had a 2 door Jeep Wrangler (2000 lb tow capacity) which I used to tow my 320 (now for sale) so I upgraded to a 4 door Wrangler with a 3500 tow capacity. My nightmare realization is the max tongue weight is 350! The [email protected] website say dry tongue weight is 390! And wet is 400. Would it be dangerous for me to tow with the vehicle I just bought for this purpose???? Is there anything I can do to lessen this weight? Remove the propane tank? Take out the table? UGH!!!! Update: I think I can get a weight distribution system to help with the tongue weight. Just when I thought I knew everything...alas I'm still learning hahahaha. I'm ok with the overall towing capacity at 3500 pounds. I dont plan to lug a bunch of gear. Looks like no one else wants to be the bearer of bad news, or there would be some responses by now. You really don't want to be at the limit of your tow vehicle, you want some margin. We tow a 320 with a 4 door Xterra, similar dimensions to a Wrangler. The Xterra has a 500 lb. tongue weight and 5000 lb. tow rating, and I wouldn't tow a 400 with it. It's a short wheelbase vehicle, and the 400 would "wag the dog". You really need a longer wheelbase, and a tongue rating of 500. That's my .01c for the 400. My other .01c, since you haven't bought the 400 yet, there are other larger trailers out there that don't have the tongue weight issues of the 400. I love NuCamp, but there are other quality trailers out there, so don't feel you are stuck with your new Wrangler. Oh I didnt see your response before I just edited my post. Good point. I will look at other options now. Lucky I didnt buy the camper too! My new Jeep came with a feature....trailer sway control. It senses if the trailer is swaying and applies the opposite break. I will definitely take a hard look at this. Thanks for your input. I was towing my 320 with my 2 door wrangler with no known issues, but now I'm thinking back I was likely over the tongue weight. I added two six volt batteries and a power jack to the tongue. I never felt any issues. I had the sway bar, but perhaps I just got lucky. I still have the 320 so perhaps just keep it and tow with new Jeep! I really wanted more space though after 4 seasons in the 320. I will check out some other models though now. Things happen for a reason. I'm no expert, and my vehicle doesn't have any way control features, so I don't know had effective they are. Hopefully you can find someone, maybe Nu Camp, that can give you good advice. 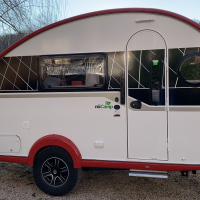 We looked at Casitas and Scamps before we got our 320, and while they aren't [email protected], they are still fantastic little campers, with more modest tongue weight requirements. The teardrop shape unfortunately becomes a problem as you get bigger. Thanks for your help. I see I have some homework to do. I forgot about the Scamp. I will take a look. Thanks! this is a good subject. does adding weight distribution reduce the weight on the hitch ? i dont know i am no expert on this. From what I can see online, it doesnt increase the tow capacity of your vehicle but it does seem to give you a bit more tongue weight capacity...still researching though and I am definitely not sure about that. I'm going to call Chrysler Jeep tomorrow and NuCamp. I will post with anything I learn. I’m know expert but I think you could safely tow the 400 with your unlimited Jeep. You will definitely need a good weight distributing hitch and a brake controller. I would talk to the dealer for professional advise. I tow with a 4Runner and just wouldn’t go any smaller or lighter on the tongue weight. Sway control is important and the electronic systems are great but it’s like making a BLT sandwich; remove one of the letters and it just doesn’t work. A weight distribution hitch is essential for this to work at all as it will send some of the tongue weight to the front axles. This also means you need to look at axle ratings as well. To start off, try calling Equalizer and go over the specs with their tech team. That will give you one datapoint from a disinterested party. Your challenge in in my opinion lies in the wheelbase. Let the engineers at the above two places guide you. Oh yes, brake controller is a must. I had that in my 2 door Wrangler but my new Jeep is the new JL model that just came out and there is not yet a wiring harness for the Tekonsha controller. That's another issue I need to address. Thanks a bunch for the technical contacts....found a useful activity for myself during the govt furlough! I've got some calls to make tomorrow!!!! I will post with what I learn. @robyn769 most new vehicles at least with a tow package come with a pigtail for a brake controller, makes it easy to wire in a controller of your choice. If the new Jeep doesn't have a tow package, that might be telling. I think the 400 is likely out with either Wrangler, but I am sure somebody has done it, I think I saw a post here or on one of the FB groups. I was thinking that way too until I did a little research, sorry you are in the spot you are, but better to find out now before buying a 400. Oh yes, I wasnt clear. It did come with the pigtail under the steering wheel. The part that I need is the wiring harness that comes out of the brake controller and plugs into the factory installed pig tail. Yes, Im trying to make myself feel better about it. Best to know this now for sure. Hey, I still got a new Jeep right!! @robyn769 ; IMHO the Jeep JL with Class II tow rating is too small to safely handle a [email protected] 400. You will be exceeding the tongue weight whenever the [email protected] is not 100% empty while you will be very near the JL's maximum towing capacity when [email protected] has typical camping stuff loaded. Expect you will also be operating the JL very near or over its GVWR when loaded and towing in "camping mode". Also don't forget the 3,500# rating is at sea level on level ground with only gas & a driver in the vehicle, not towing in hills or at elevation, or with real-world passengers & gear. Each pound added to the JL above that full tank of gas and the driver reduces the towing rating by an equal amount. So if you have say 500# in the JL (Passenger, dog, gear, tongue weight) your tow capacity has dropped to 3,000#. Elevation then reduces tow capacity by 3%/1,000ft. Thanks for the excellent technical breakdown...now time for my breakdown. Woe is me. I have two different people coming to look at the 320 this weekend. Guess I better hold onto it now. Good grief Charlie Brown!!! I found this cool calculation tool...problem is I dont know what to put in 70% of the fields!! I looked at the specs, and the Casita 16 deluxe would work with your Wrangler both weight and tongue. It would still be an upgrade in size, and tank capacities. They can be hard to find though. Thanks for the tip! I heard there is like a 6 month wait list...they must be great! I personally have know problem going to tow limit capabilities. Why have a limit if you can’t use it to the limit. Engineers always build in additional capacity to allow for a safety margin. This is my personal opinion. You should only do what makes you comfortable. Thanks Dale. This is exactly what I was thinking, but that doesn't mean I'm right, haha. Im feeling that the weight distribution hitch is going to make it safe. I have actually posted a very lengthy post on the Jeep Forum as well. I listed all the specs for the brand new Jeep model as the items may have an impact like I have built in trailer sway damping and "heavy duty suspension with gas shocks". I also know I camp alone and I'm a minimalist. I'm also thinking I can remove the propane tank and put the spare tire inside the jeep midway. I kept the spare from my 320 in the jeep already because it used to drag getting gas. I actually hate to think now what I had been ignorantly doing in the 2 door Jeep. I'm sure now I was well over tongue weight. Ignorance is bliss I guess if you get lucky which I did. I plan to not repeat the ignorance. I will let everyone know what I find out on the Jeep forum. Nucamp is closed until next Thursday. I found this cool calculation tool...problem is I don't know what to put in 70% of the fields!!
. . . have actually posted a very lengthy post on the Jeep Forum as well. I listed all the specs for the brand new Jeep model as the items may have an impact like I have built in trailer sway damping and "heavy duty suspension with gas shocks". I also know I camp alone and I'm a minimalist. If you also posted "all the specs" for your JL here we could help with the WC vs. WD calculator. Key specs are GVWR, Axle Ratings; found on the JL DOT limits sticker. CVWR, curb weight, payload; are helpful and might be in your owners manual. Distance in inches from center of rear wheels (axle) to tow ball. Your best guess on how much weight you will be adding to the JL & [email protected]; for example [email protected] spare is~40#. The more data available the better any towing estimate will be. Using many assumptions since I do not have the GVWR, etc data I ran the WC vs WD check before my earlier post and was concerned about the JL GVWR towing a [email protected] 400 as well as the basic fact that a [email protected] 400 exceeds Class II tongue weight . . . which will most likely be the case with or without WD hitch. Let me gather what I can. I tried to copy paste what I typed on Jeep forum but its not letting me paste here. Standby....I did find out that I have a class 2 hitch so the weight distro hitch is out I think that is the nail in the coffin on this endeavor...but holding out tiny bit if hope. Going to ask Nucamp is there is anything I could do on a custom build to lighten the load...doubt it though. Let me get on my laptop and post the stuff I posted on jeep forum. Not letting me go on my phone. I'm also thinking about things that I can remove from the camper to potentially reduce its dry weight/tongue weight like the propane tank on the tongue, spare tire. I can tow the tire inside the Jeep to help a little with the tongue weight. Maybe I could switch to this class 3 hitch so I can use the weight distribution hitch? I'm about to throw in the towel on this effort. Cry cry cry. oh, good tip!! I couldn't get anyone to understand what I was asking when I was trying to ask what you just said! I even asked can a class II have a 2" hole and was told no, but perhaps I just need to buy the Class III hitch and put it on and be SURE!!! Its not expensive. I just HOPE IT FITS! When I look at all websites other than MOPAR/JEEP like eTrailer and every other website when I type in my vehicle type it comes up with the class III. I wish I could find somewhere on it what it is. Very odd the factory sticker would have Class II if it is in fact a Class III, I would double check the sticker. I ended up calling Jeep directly and put in a "trouble ticket" they are going to get an answer for me. The website also shows Class II and the official MOPAR website for Jeep parts also says Class II, but NONE of the after market websites I've gone to and typed in my vehicle come up with a class II hitch. Chrysler created a ticket for my question, but it will be late next week at the earliest that I can expect an answer. Jeep most likely installed Class III hardware because there is more 2" equipment out in the real-world. However, they have rated the JL as a Class II. Some place on the hitch should be a maximum towing and tongue weight sticker . . . and I bet it matches the sales window sticker.